If you're unable to travel to our Grange-over-Sands branch, St John's Hearing Aid Centre also work throughout the Workington area and can provide many of our services in the comfort of your own home or residential care facility. Visits are by appointment only. We will never call without letting you know first and for your comfort and safety, we will always let you know the name of the person who is coming and they will carry relevant identification. You can read more about St John's Hearing Aid Centre and our approach on our About Us pages. As part of our Free Home Consultations service, we offer Free Hearing Tests carried out in your home by experienced and qualified audiologists. 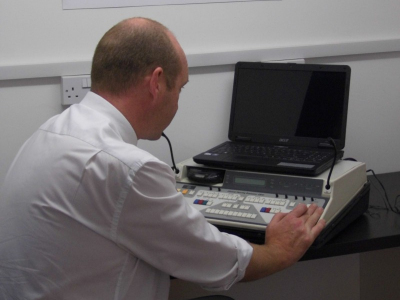 We offer free hearing tests in the comfort of your own home or residential care facility. If you're experiencing Hearing Loss, these audiometric hearing tests will establish the cause and the potential severity of any ongoing condition. If required, St John's Hearing Aid Centre supply a wide selection of digital private Hearing Aids from well-known brands, such as Oticon, Phonak, Starkey, Widex and more. Whether you're looking for an In The Ear (including invisible), Behind The Ear or Spectacle hearing aid, our qualified audiologists will help to advise you on the most suitable digital hearing aids for your specific requirements. As well as fitting your hearing aid, they will fully explain its functions and controls. And if you have further questions or experience any teething issues post purchase, you can call our Grange-over-Sands branch for aftercare. We also offer a gentle Mobile Ear Wax Removal service in your own home. Our trained technicians can remove a build up of wax using one of two techniques, either by microsuction or via irrigation. Please take a look at our Ear Wax Removal page for more details. Our Grange-over-Sands branch can carry out hearing aid Servicing, Calibration and Repairs, as well fit new batteries for most makes and ages of digital hearing aids. If you're housebound or unable to get transport, we may be able to do repairs at your home. Alternatively, we offer a postal service to send hearing aids in to us for a quick turn around. Please contact us for details. From our branch in Grange-over-Sands, our private hearing consultants offer Home Visits throughout the Workington area, including Bassenthwaite, Cockermouth, Distington, Drigg, Egremont, Gosforth, Keswick, Maryport, Seascale, Nether Wasdale, Whitehaven, Workington and beyond.